Are you a technical product manager or a developer interested in product management / deployment / usability skills? Join the Product Developer track and test your skills at our 2-day hackathon. The best developers think about the product – come and learn how they do it. WHAT’S GOING ON AT PRODUCTCON? As the world becomes more open and connected, the demand for creating better more unique products increases exponentially. It is becoming impossible to throw sales and marketing dollars at bad products. What makes a good product? How do you determine product-market fit through prototyping? Hundreds of thousands of companies are facing these questions. ProductCon is the new convergence of professionals who want to know: How do I create a product that customers love? 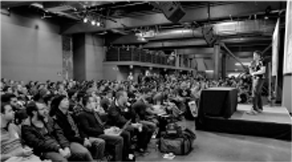 ProductCon includes 400+ professional product managers from around the nation. These span both early tech startups, later-stage tech companies, and Fortune 500 attendees. Most product managers have technical backgrounds and work on technology products. ProductCon includes hundreds of technology professionals who participate in Product Marketing. These attendees make technology purchase decisions on media / ad buying, app marketplace advertising, and go-to-market strategies. WHAT COMPANIES ATTEND DEVNETWORK EVENTS?